SML Isuzu Ltd. (SMLI) is a trusted and reliable commercial vehicle manufacturer since 1985. 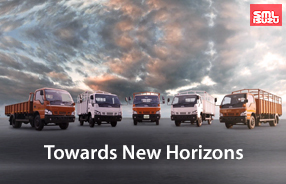 It has over 33 Years of experience in producing Light & Medium commercial vehicles to meet the Indian customer needs. SMLI is a first company to manufacture and supply state of the art fully built Buses, Ambulances and customized vehicles. Sumitomo Corporation, Japan and Isuzu Motors, Japan respectively holds 44% and 15% shareholding in the Company.